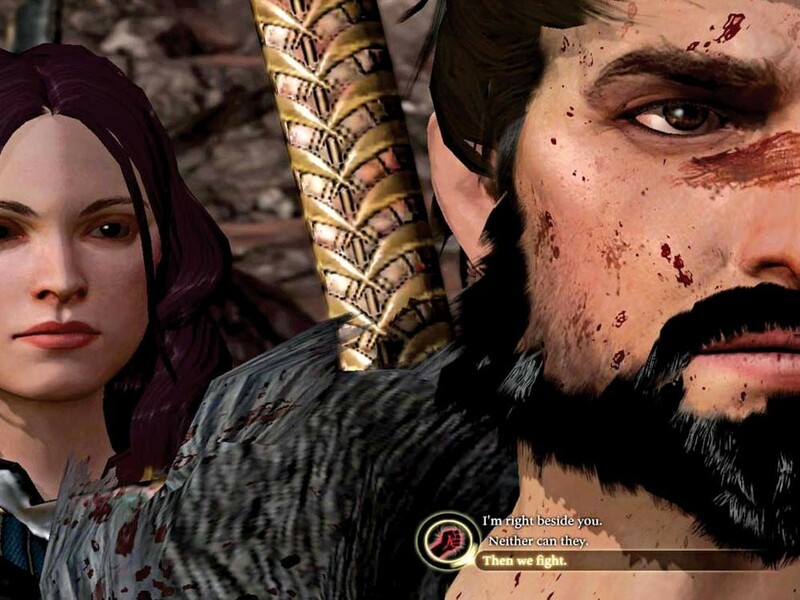 Dragon Age II is D&D meets Charlie’s Angels — and about as up-to-date. I haven't seen you in the dragon's age! Picture yourself walking into the middle of a camp of bandits, holding twin daggers at your sides. The bandits, surprised by your appearance, leap to their feet, drawing swords and knives, crowding around, moving in to attack. Then, from behind you, three tall, buxom women come striding into the camp. Two of them are holding long staves in their hands, the ends dripping with glowing magic energy. The other woman is wearing a guard’s suit of armor and is raising a broadsword over her head. Together, you look like Charlie’s Angels pimped out Dungeons & Dragons style! Welcome to the enchanted land of Thedas! Step into a world filled with magic! And not just any magic — magic caused by demons! A world where magic is treacherous and unpredictable. A world where mages and their demon consorts are hunted down and locked away by the government. But don’t worry — for some reason, that doesn’t stop adventurers from always having a spellcaster or two along! Fighters and rogues are welcome in Thedas! (In fact, we favor them—much more than demon-riddled conjurers.) Adventurers can find everything they need. Standard weapons are available throughout the city of Kirkwall. Gruff merchants offer outstanding examples of Dwarven armor. Sample the (safe! legal! non-demonic!) magics that they can work into your weaponry with their runes. Rogues can even socialize with their underworld cohorts. Conduct a little light larceny. Just don’t dabble in demons! Lose your worries on the mountain slopes! Catch some rays on the sandy expanses of the wastelands. (Just don’t try doing anything like actually hiking across the desert — it’s inaccessible due to an invisible, impenetrable barrier that pretty much wraps around large portions of everything in Thedas. You can look, just not touch!) And not only does Thedas look like an early version of Everquest played on a Gateway home system, but it plays like one as well. Nothing says 1999 like knee-high ledges that characters can’t jump onto! Thedas is a land of big-concept teases and promises of adventures to come! Meet up with a dragon who will offer to guide you through the Korcari Wilds — a werewolf-strewn, ghost-haunted forest. Then sit back and relax while the dragon leads you through the Wilds via a crudely animated cutscene. Because you don’t always want to worry about all that pesky adventuring, leveling-up and basic videogame-playing associated with so many role-playing games. After all, there’s a serious story to tell. We’re talking demons here, people! THE GOOD: Be who you want to be in Thedas! Old-fashioned point systems build character! Find your own style with specialized spells and combat maneuvers. And when it’s time to relax, find whomever you want to love. We don’t discriminate! THE BAD: Forget slow turn-based RPG battles — every fight in Thedas is in real-time! And to make it even more exciting, bodies pass through each other willy-nilly! Enormous dragons can turn 180-degrees in the flash of a pixel! And every so often — system crash! THE BOTTOM LINE: With its chunky graphics, clunky flow and collision-free combat, Dragon Age II feels a little long in the tooth.